I decided to play in a color challenge on Splitcoast in the Hanna Stamps! forum. 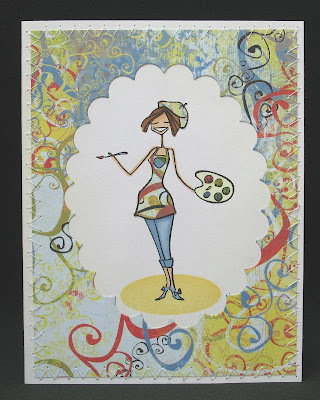 The challenge was to make a card using certain colors of Prism Paper, or they also gave the Stampin' Up! equivalents: Pretty in Pink, Tempting Turquoise, and Rose Red - a combo I found kind of difficult to use. I guess that's why it's called a challenge! I totally forgot about it until just before bed tonight, so I had to whip up a really quick card! Luckily I already had this Cake Sophie image already stamped and colored with Copics (and even some Stickles glitter glue) so that really cut down on the time it took for this card. What do you think? I got the idea of using 2 cuttlebug embossing folders and the dividing lines from Heart Prints which has some awesome samples you have to go check out! 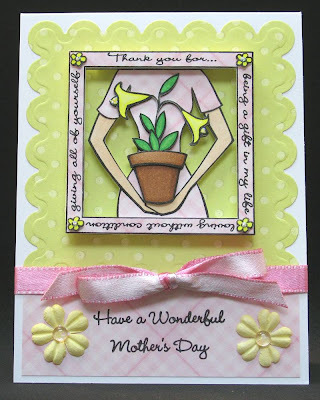 I absolutely love the look and will probably want to do it on every card I make now! BTW - I did the dividing lines with my Scor-It. Other materials used: Sentiment also from Hanna Stamps! ; Swiss Dots & D'vine Swirl embossing folders from Cuttlebug; punches (designer label, small oval, ticket corner, 1/2" circle) from Stampin' Up! ; ribbon from May Arts; brads from Pink Hedgehog Crafts. I think I used about 6-7 layers in total, including a couple layers of craft foam. I even popped up the bitty flowers in the corners of the frame! I had so much fun with this set, I can't wait to play with it some more! The frame can be cut off if the words aren't quite right for that particular project, and the pot of flowers can even be used by itself. Hey, you could even just use the pot and stick some different flowers in it! Such versatility from a mini set! Other materials used: white cardstock from Georgia Pacific; patterned papers from K&Co. ; Copic markers; Stickles glitter glue; Dew Drops from the Robin's Nest; Prima flowers; ribbon from May Arts; Nestabilities. 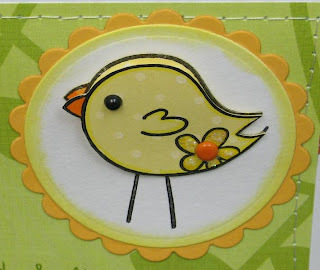 I used another Amy Rysavy sketch for today's card: I got this little chick from Imaginisce a while ago but just couldn't figure out how to use it. As soon as I saw Amy's sketch, I immediately thought the chick would work perfectly! I also just got the 2 new Papertrey Ink colors, Lemon Tart and Summer Sunrise, which are such chickie colors! Don't you just love it when a plan comes together? It's a little hard to see, but I stamped the Lemon Tart cardstock with the smallest dot pattern from Polka Dot Basics (also from Papertrey). Then I stamped the chick a couple times with black Brilliance ink and let dry. I did just a touch of detailing on the chick with a light yellow Copic marker and also added some orange for the beak. Then I cut them both out. On one, I colored the flower with a darker yellow and applied Stickles to just the petals. I also stamped the chick on a white cardstock circle so that my chick would have legs when I was done. One of the yellow bodies was glued flat on the white circle, and for the other, I put a couple of small pieces of foam tape at the top to pop up the head portion only. I stuck the second yellow body over the first, and then punched a tiny hole through the middle of the flower for all layers. Once the orange brad was secured, it held down the bottom of the chick's body. I glued on a tiny black half-bead for the eye, then sponged the white circle with Lemon Tart ink and mounted on a Summer Sunrise scalloped circle (all cut with Nestabilities). 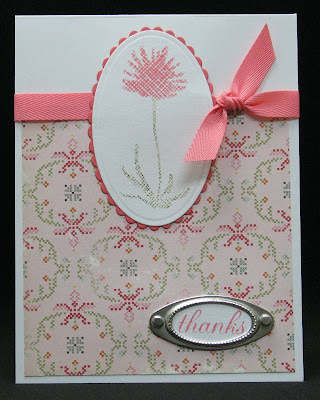 To finish the card, I used Scenic Route patterned paper that was sewn onto the base with zigzag and straight stitches. The sentiment is from Hanna Stamps. I really love how this card turned out!! Thanks to Amy for another great sketch!! I took a flower image from Silhouette Blooms II and inked it up with 2 different colors. I then smooshed it onto the Weave Backgrounder to get that lined detail. I placed my white cardstock onto the Backgrounder and pressed evenly with an acrylic block to transfer the image. I thought the resulting flower looked just like it was cross-stitched, so I paired it up with this pretty paper from Cosmo Cricket's Honey Pie collection. The sentiment stamp is also from Silhouette Blooms II, white cardstock from Georgia Pacific; metal accents from Stampin' Up! ; all other materials from Papertrey Ink. How beautiful is this swap card from my SBS-13 sister Debi??! I'm sorry this picture doesn't do it justice at all! The cardstock is metallic and rich and the rhinestones are so pretty and sparkly!! I'm so lucky to get such a breathtaking card!! Thanks so much Debi - you rock!! I learned a great technique from this post on Gina K.’s blog. Instead of just using pens to color these types of images, she actually inked the whole image with an inkpad first, and then colored with her markers. It sure saves some time!! I took one of the images from Kim Hughes’ Silhouette Blooms II (from CHF of course!) and inked up the whole thing with Pretty in Pink ink, stamped on a piece of scrap white cardstock and set aside to dry. Then I inked up the stamp again with the PiP ink, and this time I colored the branches with my Close to Cocoa pen. After stamping, I set this one aside to dry as well. I then cut out the entire 2-color branch image, and then only 2 of the flowers from the scrap image. Because I thought foam tape would be way too thick to pop up such tiny flowers, I punched 4 1/8” holes and used 2 each to pop up the flowers. It gives them just the right amount of dimension. Even though all that cutting was a little crazy, I really love how this card turned out and may make more! Other materials used: Grid Paper Backgrounder, sentiment from Silhouette Blooms II from Cornish Heritage Farms; Pretty in Pink cardstock and all inks and pen from Stampin' Up! ; ribbon from May Arts; Stickles glitter glue; long scalloped rectangle Nestabilities. It's for a good cause and you get some cool stamps at a discount! Hope you will all check it out! I'll be placing my first MFT order so you'll be seeing some cards soon with these stamps! I got an idea in my head last weekend that I wanted to try using up a whole piece of patterned paper at one time, rather than only making 1 card with it and having a bunch of scraps left over. So I tried it out, and while I only started with a 6x6” sheet and my use of the pieces isn’t terribly creative, I’m happy that I actually did it! And instead of only having 1 card after a stamping session, I’ve got 3! Artistabella is the last new Bella that I have from my first order (but I just placed another order yesterday so I’ll have plenty of new images to show off soon!) and I thought she went perfectly with this sheet of PP from Basic Grey’s Cupcake collection. To me this particular paper felt like the doodlings of an artist. As per my usual, I paper pieced her apron and beret, and then colored the rest of her with Copics. For the palette, I used Spica glitter pens in colors that matched the PP. 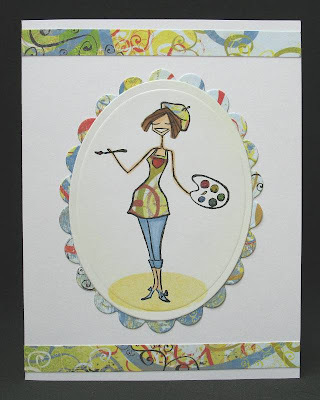 I used Amy Rysavy’s masking and oval stamping tutorial to ground her and as a last touch, I airbrushed a pale yellow around her for a bit a background. 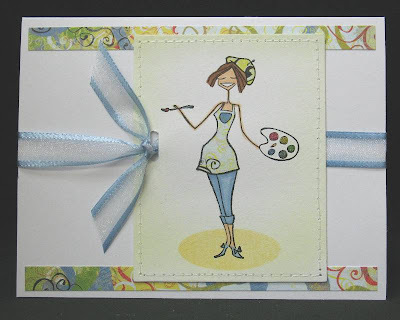 For the last card, I colored plain white ribbon with the same blue as her pants for the perfect match. Oh, and I did just a bit of sewing on 2 of the cards. Other materials used: white cardstock from Georgia Pacific; black Brilliance ink from Tsukineko; Barely Banana ink from Stampin’ Up! ; Nestabilities from Spellbinders. I got the Copic airbrush!! 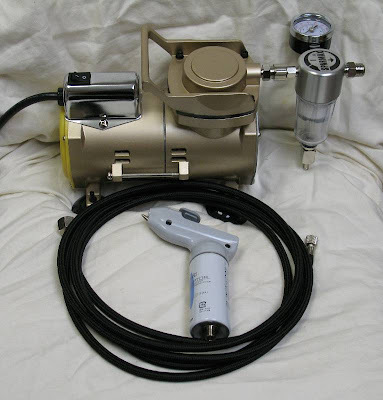 And a mini compressor so I don't have to deal with those little air cans!! I've been playing with it for a couple days now and it's so much fun I think I may use it on almost every card I make! And here's the first: You can barely tell, but all that blue sky around Riley is airbrushed. I love that it's such a soft, even coverage. Even though I’ve been buying a TON of new stuff lately, I’ve also been trying to use up some of my stash as well. I dug out a 6x6 Fresh Print Swatch Book (remember those?) in Banana and used a few pieces from it. I went with the plain yellow for my scalloped square, and then stamped the dot pattern from the It’s A Celebration set from Papertrey Ink all over the plain orange sheet. 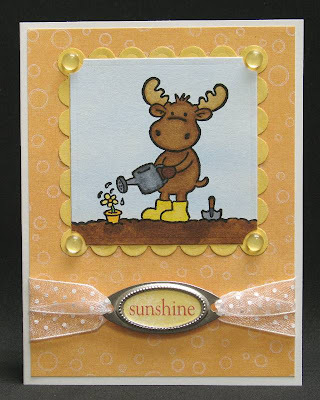 I punched out the word “sunshine” from the verse cardstock sheet and glued it into a piece from the new Hodgepodge Hardware set from Stampin’ Up! To finish off the card, I threaded some May Arts ribbon through the hardware piece and added some of those Michael’s decorative embellishments (which I’m calling Faux Drops) to the corners of the scalloped square. 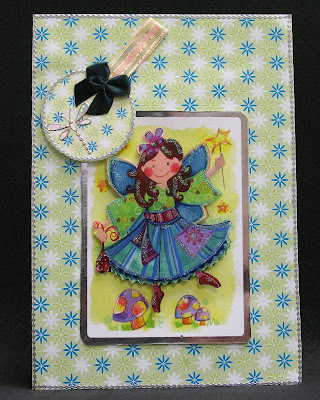 Other materials used: Garden Riley stamp from Hanna Stamps! ; white cardstock from Georgia Pacific; square and scalloped square Nestabilities from Spellbinders; markers from Copic; black Brilliance ink from Tsukineko; oval punch from Stampin' Up! ; Eclipse masking tape. I got my swap card all the way from England from Jo yesterday – isn’t it gorgeous?!?! I love all the fun colors and dimension and glitter and silver stickers, especially the dragonfly. 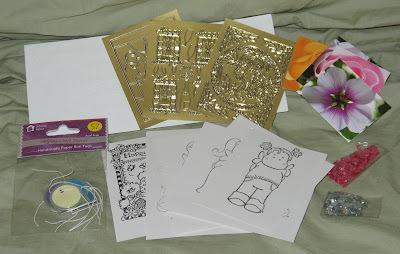 Stamped images, sequins, tags, stickers, and some beautiful flower images with glitter – so pretty!! I can’t wait to play with it all! Thanks so much Jo!! It was such a wonderful package to get in the mail – you are too kind and generous! I was at my local stamp store last week and they did a demo for me using Memories Mists. They aren’t a new product on the market, but they were new to me and I loved the effects so I bought a bunch of different colors. I finally got around to playing today with the Green Tea. 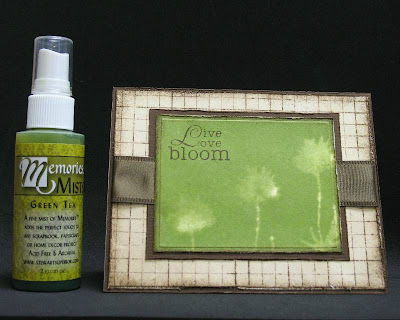 I thought the technique would go perfectly with Kim Hughes’ Silhouette Blooms II set so I tried a few of the images out and I liked this one best for today’s card (you can also see the bottle in the picture): The technique is super easy – just spray a fine mist of water on your stamp and stamp on your cardstock of choice. I stamped 3 times onto Stampin’ Up!’s vanilla cardstock. Then you just spray the Mist over it and the water acts as a sort of resist. I quickly blotted away a little of the Mist so the lighter color of the cardstock would show through, and then I hit it with my heat gun to hurry the drying time. The sentiment is from the same set (I just LOVE the simple type combined with the pretty script), stamped with Walnut Stain Distress Ink. The Grid Paper background is also from Cornish Heritage Farms and was stamped with the same Distress Ink, which is coincidentally on sale right now!! I distressed the heck out of the layers in a few different ways: (1) after stamping the grid paper, I misted with water and dragged a sponge around to spread the color; (2) sponged the edges with the same Distress Ink; (3) sanded the entire grid layer to lighten/blur the lines a little; and (4) used my Heidi Swapp distressing tool around all the edges. This card is a real departure from my normal cute stuff, but I really love it! I’m going to keep playing with the Mists (they showed me a couple different techniques) so hopefully I’ll have more cards to share using them. 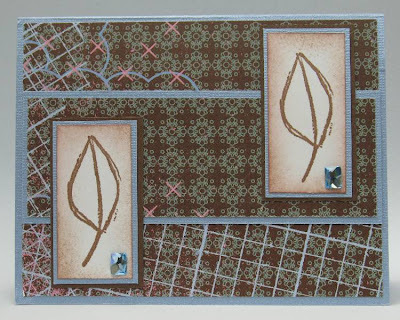 Other materials used: brown cardstock from Bazzill; ribbon from May Arts; rectangle Nestabilities from Spellbinders. 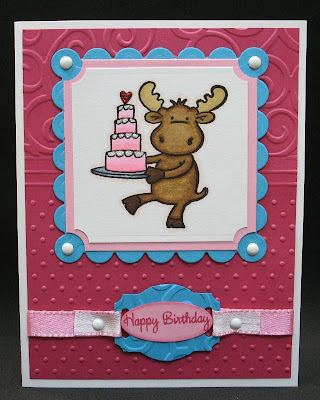 This card really shows how Pam Bassett is my stamping idol and I want to make cards just like her!! 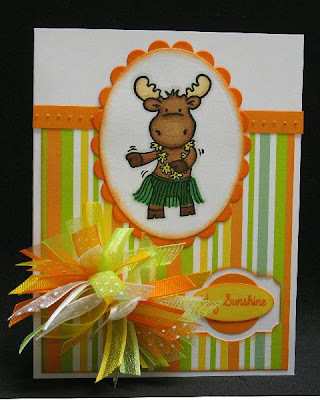 I adore this card by Pam and wanted to make something similar, but with the hula-dancing Sophie image instead. Here’s my version: This is my third try at her famous ribbon blossom, and I think I’m getting a little better at them. 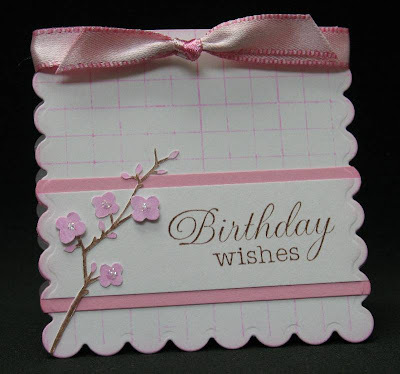 I also ended up with similar colors as Pam’s card after I chose the striped paper from Paper Salon for my background. I mimicked Pam’s punch layering, but with a slight twist – I punched the label punch out of the patterned paper, and then put the circle and oval punches in the negative space. 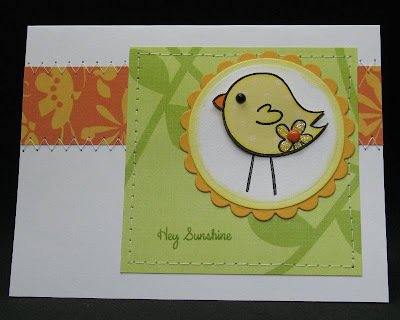 Lastly, I used the same sentiment stamp (hey sunshine) because it matches so well with these summer Riley stamps. Oh yeah, and I also did some sponging because Pam did it, and it just made it look better! I know my stuff is nowhere near the level of Pam’s art, so I hope she doesn’t mind the C.A.S.E.! Other materials used: stamps from Hanna Stamps! ; white cardstock from Georgia Pacific; orange cardstock from WorldWin; black Brilliance ink from Tsukineko; markers from Copic; all punches, Only Orange ink and grosgrain ribbon from Stampin' Up! ; white polka dot organdy ribbon from May Arts; all other ribbon from Pink Hedgehog Papercrafts; Nestabilities dies from Spellbinders.